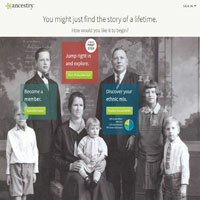 Ancestry.co.uk is the UK portal for our number 1 genealogy site, Ancestry.com. You can build an in depth family tree with images and stories, collaborate on projects, upload photos and more. There are also DNA testing services, plus the opportunity to seek help from expert researchers. Ancestry.co.uk is similar to Ancestry.com, with just a few subtle differences. The primary difference is the range of membership options available. The cheapest of these focuses on UK history and genealogical research. Its records go all the way back to the 1500s, utilising parish documents. You can search for documents easily, filtering out particular categories, which is useful if you’ve already found certain information and would rather not see it again. Once you find documents you’re interested in, you can then add files, notes, stories and photos to your family tree. As the tree grows, your research base grows and a more complete picture of your ancestors’ lives emerges. In essence, the more you work at your family tree, the more exciting it can become. If you’ve no idea where to begin, you might wish to consider the site’s DNA tests. They provide a framework to your genetic past, allowing you to understand where your ancestors came from and who they were. Tests are affordable, and can be sent off in the post. Prices include delivery. Some of the best tools on the site are included in the community section of Ancestry.co.uk. Here, you can see recent activity and also search the message boards. This search feature is great because it means you don’t have to browse through all the topics and conversations to find what you’re looking for. Chances are, if you have a question then it’s already been answered in the forums. Aside from seeking advice from the online community, you can also seek help from a professional researcher with expertise in your field. This will cost an additional fee, but if you’re really stuck then it might be the breakthrough you need. The online shop also sells software and documents which include birth, marriage and death certificates. These are reasonably priced and could make good gifts for someone interested in family histories. Ancestry.co.uk doesn’t just leave you to get on with things without offering support. The site has extensive FAQs, videos, blog posts, articles and tips to help with your research. These are definitely worth exploring, and much of this content is available for free. Ancestry.co.uk is not the cheapest genealogy site you’ll find but we think it offers very good value for money. Its service is excellent, and the tools all work well. It might not have quite as many documents as we’ve seen elsewhere, but finding them is much easier, making your research more accurate and enjoyable overall. This site offers a free 14 day trial, which is ample opportunity to find out whether it includes everything you need. From there, you can decide whether or not to pay for the complete service and continue your voyage into the past.